Dealing with age discrimination when job searching isn’t easy – it can be frustrating and mentally draining, and you might even feel like giving up. Don’t call it quits yet, though! In this article, I’m going to share my best advice for how to overcome age discrimination in a job search so you can get hired faster and with less frustration. (Based on my experience as a recruiter). First, we’ll look at age discrimination on job applications and your resume. Then we’ll talk about age discrimination in job interviews. Finally, I’ll share more tips to help you get hired faster, as well as how to know when it’s time to contact a lawyer when you feel you’ve been discriminated against. To prevent age discrimination when applying for jobs, I’d recommend showing a maximum of 15-20 years of experience on your resume employment experience section. Then, do the same thing on the job application form if they ask you to fill in your employment history. Just match it with your resume. I’d also recommend not sharing your graduation date on your resume if you’re concerned about age discrimination. For your email address, make sure you’re using an email provider that’s viewed as “modern”, like Gmail. Avoid Hotmail or AOL email addresses. Also, on your resume, put a link to your LinkedIn profile. This will show employers you’re staying current with your networking, etc. If you want more tips and ideas like this, I published a full article on how to avoid age discrimination when applying for jobs. Let’s talk about discrimination in job interviews next. After you submit a successful job application, pass the phone interview, and go in to meet a company, they’re going to see you face-to-face and get a better sense of your age. Go in with an open mind, and treat it like any other job seeker would treat an interview. I have a big section of articles on how to prepare for a job interview. If you need general interview help or are unsure how to interview well, go there. But spending the whole interview thinking whether you’re being discriminated against is going to KILL your interview performance. (Worrying or being preoccupied with anything else would do the same). And the truth is there are a lot of reasons you may not get a job offer from the interview. It’s hard to know. A lot of people email me saying they’re sure they were discriminated against because of age, but they don’t have any evidence. I’ll talk about when to contact a lawyer in an upcoming section in this article. But it’s important to realize that employers choose to hire someone based on so many factors – how much money you’ll require, experience, personality, even gender. (For example, I’ve had hiring managers tell me they only want to hire a woman for a role, because the team has “too many” men). So it’s quite possible to do a TON of things well in an interview and still not get hired… whether you’re 20 years old or 60 years old. You’re competing against a lot of people and you don’t even get to see those people usually. It’s impossible to know everything that went into each hiring decision. All you can do is focus on the pieces YOU can control – your interview preparation, how you answer their questions, etc. >> STOP Thinking About Age in Your Interviews! The bottom line is: If you’re always thinking about your age, then you’ll always be thinking that a failed interview was about your age. I know age discrimination happens, and it’s awful. But while you may feel your past five interviews went poorly due to age discrimination, it might be the case that two employers discriminated against you, and the other three chose to hire somebody else for an entirely different reason. That’s why it’s important to focus on your interview skills, and the things you can control! If you feel you have real evidence you’ve been discriminated against, it may be time to talk to an employment lawyer who specializes in discrimination cases. I’m not a legal expert so it’s up to you and them to discuss whether you have a case. I’d search google for “Employment Lawyer <City Name>”. But as mentioned above, I’d really recommend focusing on your interview preparation and how you’re selling yourself to employers. This is the piece you can control, and is the best way to overcome age discrimination in your interviews (because if you apply for jobs consistently, you WILL find employers who don’t discriminate and do value your skill set, but you need to be ready to impress them in the interview). 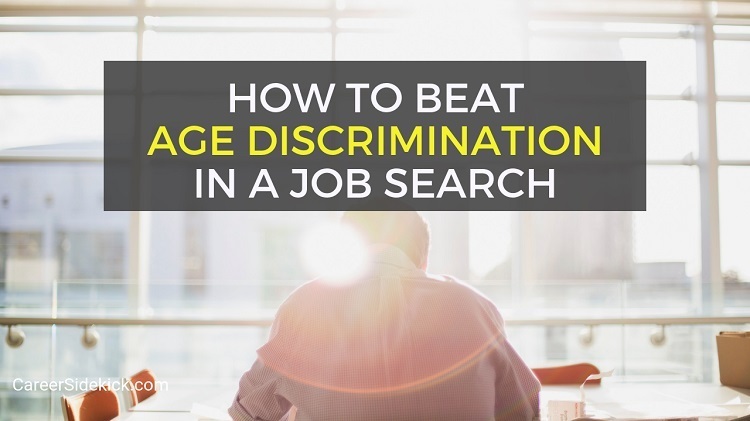 What Else Can You Do to Stop Age Discrimination When Job Searching? First, apply for a lot of jobs. Even if some employers discriminate, some don’t. You need to find them. And applying for two or three jobs and then stopping isn’t going to make that happen. So use volume to your advantage. Take a break if you need to, but then come back and continue searching! Only you can control whether you give up or not. Don’t let this happen. You decide when you’ve failed; nobody else. Also, research employers on LinkedIn and try to get a sense of their age demographic before applying. Spend your time and effort applying to companies who seem to hire people in their 40’s and 50’s, not just in their 20’s. Use your network as much as possible. In a past article, I wrote about why networking is the best/fastest way to get a job. Employers will trust you more and be likely to interview you immediately if someone they know recommends you. So make sure you’re talking to your network and seeing if they can introduce you to any employers they know. This will immediately boost your chances of getting the interview and getting a job offer from the interview. Focus on the aspects of the job interview that you can control – your interview answers, your preparation, etc. Most importantly – don’t give up. Take a break if you need to, but don’t stop searching! Only you can control whether you quit or not. If you follow the steps above, you’ll give yourself the best chance of getting hired and beating age discrimination in your job search.